When tenHsPower is installed on the HomeSeer server PC, an evaluation utility tenPowerEval is also installed. This utility runs outside of HomeSeer, and displays the operating system's UPS values. You can use this utility to determine if your UPS and operating system are setup properly for tenHsPower. While tenPowerEval is running, try unplugging the UPS unit from the wall to see how the UPS values change. For more information about Windows and UPS unit go here. 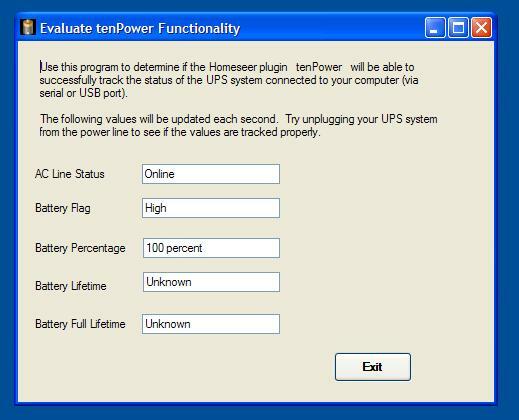 If you just want to download the tenHsPower utility to see if your UPS will work with tenHsPower, click here.